Please note that the photo above includes green peppers, but the plan calls for red peppers. Peppers can be interchanged easily in recipes, so feel free to use either red or green…depending on what your store has, and what your taste preferences are. Love this simple one-dish vegetarian meal. Hope you do too! In a large saucepan, bring 3 1/2 cups of water plus the lime juice to a boil. Add the brown rice and minced onion. Return to boil, reduce heat to medium, cover and let cook for 45 to 50 minutes, or until brown rice is tender. Once the rice has cooked, mix in the diced red/green pepper, corn, tomato sauce, cumin and chili powder. Let simmer over low heat for 5-10 minutes. Season with salt and pepper to taste. Prepare broccoli or green beans. 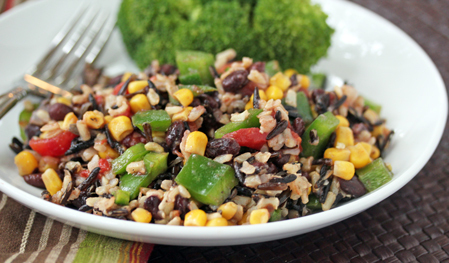 Serve Southwest Rice Pilaf with side of veggies. Hi- recipe looks great, however I thought I saw black beans in the picture and yet none are noted in the recipe. Is it supposed to have black beans?